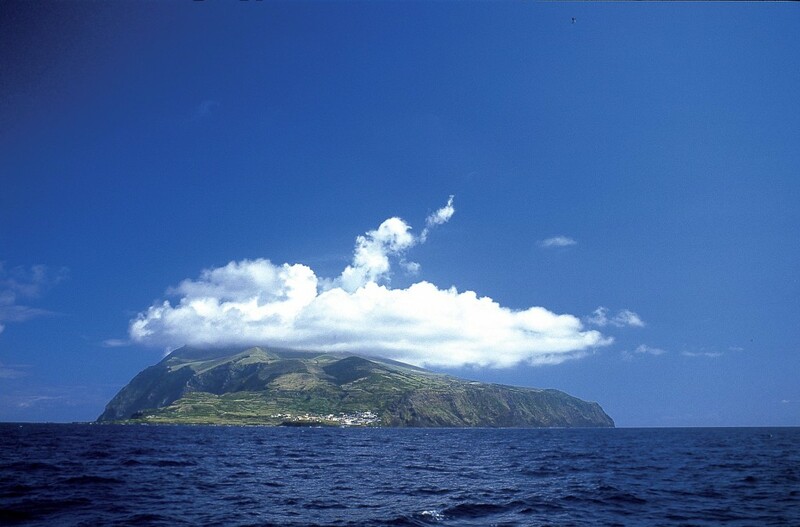 We’ve been receiving daily reports for the update service from a walker in the Azores. His report on his visit to Corvo from Flores (Walk 30) makes great reading for seafarers and walkers alike – how we would have loved to be there with him! “There seemed to be just two options available when we arrived in Santa Cruz port this morning: the Atlantico line ferry, which normally must be booked in advance, and the more adventurous open dinghy service, which gets up close to the spectacular northeast coast of Flores, including dodging between stacks and entering a sea cave. Price of both is 30 euros per person return. Those taking the Atlantico ferry set off at 9:30 and headed straight for Corvo, where there was no minibus waiting for them! We set off after 10 and when we eventually hit the open sea, I got drenched, but then I had managed to select the worst possible place to sit. After an interminable white knuckle roller coaster ride in the heavy swell, we arrived in Vila Nova to find a minibus waiting, still 5 euros to the caldeira. We passed the three Atlantico walkers before long and at the end of the road, most of the passengers, deterred by a cold wind, went back down after taking a few snaps. Three people headed for the mast, but we headed down into the caldeira on the official route PRC2COR. The estimated time for the complete walk: down, around two lakes and back up is 2.5 hours, but we had less than 3 hours to be back at the boat, so a little improvisation had to be employed. We were soon rewarded by sunshine and after a very brisk hike around the nearest lake and back up, I’d managed to dry out my underpants. We sauntered back down to the port in high spirits and bright sunshine with 20 minutes to spare. This entry was posted in Azores. Bookmark the permalink.